Postcard handwritten by James G. Lang, ordering a shipment of eggs from Oakland (possibly eggs of Guinea hens, for the purpose of breeding). 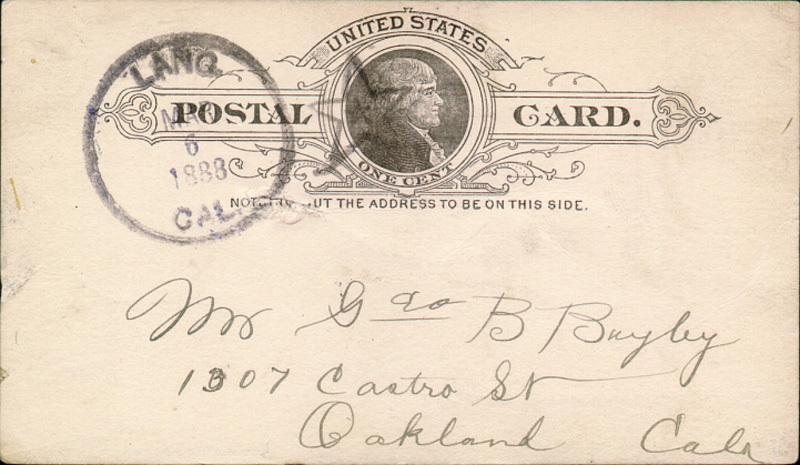 Preprinted penny postcard dated and postmarked March 6, 1888, at Lang, California; received March 7, 1888, at 12:30 p.m. in Oakland. Card probably was placed directly onto a northbound train at Lang Station. If you have not shipped the eggs please ship soon as possible or if you cannot send them right away let me know when you can ship them, as I need them very much. HS9026a: 4800 dpi jpeg from original postcard purchased 12-1-2003 by Leon Worden from a stamp dealer in Chicago.